New dog of any age and puppy guide lines. Make sure your home is dog/puppy proofed, before you bring your new friend home, and prevent any problems. Setting clear boundaries: Whether your new dog is eight weeks or twelve years the boundaries are the same. Please be a good role model for your dog, be calm and consistent. Shape the behavior that you want, from the moment you bring your friend home. This takes time, there are no quick fixes. By Shaping your dog's behavior in a gentle way, and recognize that any dog training takes time, and consistency. (You can start from scratch with any dog, any age, any breed. By re-shaping their behavior, and please remember that any training takes time, be patient). Every dog is different, with a different personality, even if you have had this breed before, you may not of had this personality. Take the socialization slowly! Your new dog/puppy needs to trust you, and this takes time. Praise: Please use praise, as this shows your dog what he/she is getting right. By saying good boy/girl you are showing them how to behave. Ignore what you can, and guide them to make good decisions by using praise. This is the kind/positive way to train a dog. 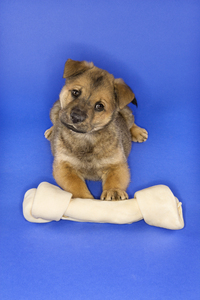 Food & feeding: Ask the breeder/rescue group for some of the food that your new friend is on. This you can change later and very slowly. Otherwise your dog will have an upset stomach during the first week or so. Use a measuring cup to give the right amount of food per meal. Check the back of the packet to get the right number of cups per day, this is by weight and age. If an older dog is over weight, slowly reduce the food portions, do not rush into taking the weight off, go slowly, and ask a vet for advice. Please never remove your dogs bowl when they are eating, this is not a way to test them. In fact it is the quickest way to teach a dog to guard their food, and by doing so you will be teaching your friend to defend their bowl/ their survival. Give them space/peace to eat. Your dog's space: Keep your new dogs space/area small to start with, and not a crate, that is just for puppy training at night (a young dog could be in a crate for safety reasons, during the day if you go out, but only for a short time). Use baby gates/ex-pens/puppy play pens etc, these should be appropriate for your dog's height and weight. Limit them to a room to start with, remember that dogs are pack animals, and need company. The room could be your kitchen if you are around during the day, or if you work from home, your office. In no time at all your new friend will be ready for more rooms to explore. By taking it slowly you will ensure that he/she behaves well in your home, and they will not of been set up to fail, when you gave them to much space to soon. Prevent problems: Prevent your new friend from getting into mischief! A new home can be a minefield. Guide your dog to make the right decisions in their new home. If you go out keep, your dog safe, in an area away from electrical wires, anything that he/she could injure themselves with or cause damage to your home. Prevent injury to your dog, and keep your home in one piece. Some dogs have separation anxiety and will chew your home up. Chewing is a calming mechanism, that releases endorphins and calms the canine. Other people: Do not invite everyone you know to meet your new dog, spend time together at home. There is time for friends and family to say "Hello" later. Build your relationship first. Do not overwhelm: Stay home for the first few days, this will keep their world small and you will not be setting them up to fail. Too much to soon! Please do not overwhelm your new friend. You have the rest of your lives together, so take your time stay home for a while. Allow your new dog/puppy time to decompress/settle. Give your new dog time to trust you before going out. Puppy classes & Dog Training Classes. Take your time to get to know your puppy's/dog's personality before taking them to any training classes. Some puppies & dogs can not handle the pressure of training classes (dogs, people, smells, sounds, car ride, etc. They become overwhelmed). Please get to know them first, and how they might react around other dogs and strange environments-no need to rush. Everything will still be there in a few weeks. Build trust at home, and your relationship will grow. Any relationship needs the right foundation and your relationship with your dog is no different. When the time is right, and your dog relies on you to take the lead/make the decisions, then most things are possible. (Perhaps your dog will never handle a class environment, it's OK-Work at home with your friend). They are all different-even if you have had this breed before. Love your dog for who she/he is and have fun together (Playing). Exercise/Walking: Exercise can be playing, so do not rush straight out for a walk. They need to learn to walk with you at home and in your yard first. Young dogs should not be walked until they have had their shots. Older dogs need to learn, not walk you. Put the time in now, and enjoy a walk with your new friend, if you want to walk. A walk should be a pleasure, not a painful or embarrassing experience. Begin off leash inside. 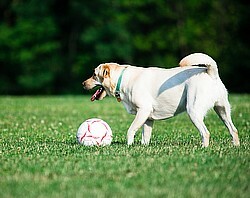 Start to train your dog/shape its behavior, come, sit, heel, stay, etc. Get them used to a leash and your walking style. Use food rewards. If you have an older dog with weight issues, then use food from their daily allowance. Using food rewards does not mean a dog needs to gain weight! Keep your dog fit and healthy, and he/she will live longer. For more advice on walking your dogs the right way, please go to the articles page on this web site, and read Taking the lead. Please play with your dog, and they naturally play in spurts (playing for a few minutes, resting and so on). Never let your dog off leash if you are not sure that their recall is 100%. Dogs are killed each day, when off leash, having poor recall/come, and not knowing stay! Learn to hang out and show your dog that the world is not a scary place. Watch the world go by, sit on your porch and watch people, light traffic & dogs go by. Children: If you have children, make sure that they interact properly with your dog. It is important that an adult monitor the children and their new friend together. Make sure that both are safe, and not put in a position where they feel threatened. Children move quickly, and can be loud, not every dog can cope with that immediately.Teach your children the right way to interact with any dog, talk to them about not going up to strange dogs (in fact they should not go up to any dog, the dog should always move to them).This is simple parental management. Guide both your children, and your dog, and watch their relationship grow! Adding another dog: Already have a dog, and want to introduce another one to your home? Go very SLOWLY! Get to know the personality of your new dog/puppy. Meeting on neutral territory is always a great idea, somewhere where they can safely interact. Have them both on a leash, manage the introduction. Protect them both from failing and do not leave them alone until you are sure that they are both to be trusted. Any relationship takes time, there are no instant best friends! Guide their relationship.To begin with, feed the dogs separately, just in case one feels uncomfortable about sharing its space with another dog around feeding time.This can change later on, if they are all comfortable around one another. Some dogs never like having another dog around when they are eating. 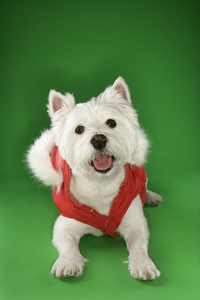 Give your dog a break: Provide your dog with a place where he or she can feel safe/escape/chill out. We all need down time, your dog is no different. Stay calm: Our emotions, voice, behavior effects our dogs, so stay calm, use a gentle voice, keep your home calm and you will have a calm dog. If certain people effect your dog, gently put your dog in another room, and bring him/her out when/if they can cope with the situation. Accidents are bound to happen: Potty training, if they have an accident clean up without them seeing you do so. That way you have made nothing of it and they will not repeat it. Do not say no, or react, as again you have made something of their behavior. To get the to relieve in the right place, take them to the right area of a long leash, and ask them to go. Be patient and give them time, even the older dogs need to smell a new area/place. When they go in the right area, praise them and reward them (a food reward). Give this time to work. Very soon they will dash to that spot and go because you made it worth their while to get it right! None of us work for nothing. Back yard: Garden/back yard. If your dog will be spending time outside alone, please make sure that your fences are sound, no gaps where a dog could get through, also make sure they are high enough. Provide shelter from sun, wind, rain etc. Fresh water is a must. Dogs dig, and your yard will not look the same, lawns will become yellow form your friend relieving there. This is part of having a dog. Perhaps consider getting a large dog run, one that has shade from the sun, rain, wind. Make sure there is always fresh water available. Something for your friend to play with, bones or toys should always be in good condition, outside weather can effect some toys, and small bits can be swallowed. Check the area daily, if you are going to leave your dog there for any length of time. Come/The recall: Always ask your dog to come to you, not the other way around. This way your dog will see you as its leader/trusted guardian. If you go up to your dog, you are theirs. Never ask your dog to come to you and then do something it does not like, your dog will never come again! Make the request "come", positive-every time. Summary: By starting the right way, you will have a friend who will listen to you, and trust you where ever you are. Perhaps you will never need a dog trainer/behaviorist! Prevent a problem, this is much easier than solving one, a dog of any age can learn something new. Guide your new dog's behavior, and enjoy your friend. Are you calm and consistent? Be a good role model for your dogs. This is one of the biggest mistakes that people make. Did you know, that your emotions affect your dog's behavior! Please consider reading the Book, The Dog Listener by Jan Fennell, this can be found at most libraries. Louise Pay, The East Bay Dog Listener. Simply kind dog, puppy, & pack behavior training Bay Area CA. Take the lead CA. Amichien Dog Training for any dog, any age, and any breed. If your dog's behavior has suddenly changed consider taking your dog to the vet, even an UTI can effect your friends behavior.